Every time there's trouble crossing the Channel — strike action, bad weather, a tunnel fire or even difficulties holding back crowds of would-be migrants — the words "Operation Stack" enter the news. Somehow, all these things happening in Northern France, or affecting railways and shipping, bring the roads of Kent to a standstill. What is Operation Stack? And why has nobody come up with anything better? Any closure or reduction in the capacity of Channel crossings between Dover and Calais has a very major and sudden impact for the movement of freight between the UK and mainland Europe. As soon as ferries or trains stop running, heavy goods traffic begins building up on both sides of the Channel, as drivers running to tight schedules arrive for their crossing and find it delayed. All those vehicles (and drivers) have to go somewhere, and the terminals (the port at Dover and the Channel Tunnel terminal at Cheriton) have limited capacity for queueing vehicles — ordinarily they simply rush traffic through as fast as possible to keep things moving. 90% of freight traffic between the UK and the rest of Europe passes through either Dover or the Channel Tunnel, but the number of HGV parking spaces is severely limited. Operation Stack is the scheme developed by Kent Police, in conjunction with Highways England, to queue (or "stack") the delayed freight traffic until it can be loaded onto ferries or trains. It works by closing parts of the M20 and using it as a vast lorry park. The first three phases of Operation Stack can hold about 3,000 lorries, which usually provides enough capacity for any closure of the crossings to Calais. In 2015, for the first time, a fourth phase was introduced, which some reports suggest allowed a further 1,600 lorries to be stacked. Operation Stack was first implemented in 1988, but it was used most intensively in summer 2015. It was in operation, intermittently, for most of July 2015. When capacity for freight to cross the Channel becomes limited, Kent Police discuss the problem with Highways England and an agreement is reached to begin Operation Stack. The M20 is closed by Kent Police, using powers provided under the Civil Contingencies Act, and diversions are implemented. The closure will initially only be Phase 1 of Operation Stack, but if conditions worsen and more space is required, subsequent phases are brought into use. At the point of the closure, the motorway is fully closed, with all traffic diverted off the M20 onto the sliproad to the junction. Ordinary traffic is directed to use the diversionary route (which, for effectively the full length of any closure, is the A20, a former trunk route of a reasonably good standard that was the main road to Folkestone and Dover until the M20 was completed in 1991). HGVs destined for Europe are directed back on to the M20 via the entrance sliproad at the same junction, which is controlled by police. On the motorway, two queues are formed, one on the hard shoulder and one in lane 3, which leaves two clear lanes for access down the middle. One queue is of lorries waiting for ferries and the other is for lorries waiting for the Channel Tunnel. All drivers are given tickets indicating their arrival time and their planned crossing. While Operation Stack is running, no HGV can board a cross-Channel ferry or Channel Tunnel train without one of these tickets. As ferries and trains become available to board, lorries are released from the queue in blocks, in order, and proceed through the queue under police supervision to leave the stack. This happens, rather than allowing the queue to creep forward like an ordinary traffic jam, so that drivers can park up and rest. They may be stationary for upwards of 12 hours at a time. Portable toilet facilities are provided on the verges of the M20 for those enduring long waits. Elsewhere on the road network, electronic message signs warn that the M20 is closed, and often mention the codename "Operation Stack". Occasionally signs in or close to Kent will just show the message "Operation Stack" on its own. On the M20 between London and Maidstone, successive signs direct domestic traffic for Dover to divert to the M2 and freight traffic to stay on the M20. The main diversion route for local traffic that would otherwise use the M20 is the A20, which runs directly parallel to the motorway. It is a single carriageway with many local junctions and at busy times of day becomes severely congested. Traffic from further afield will usually divert onto the A2 and M2, a parallel motorway route just a few miles to the north of the M20. This route is usually busy with its own traffic load and additional traffic diverting from the M20 can cause additional traffic problems on this route. 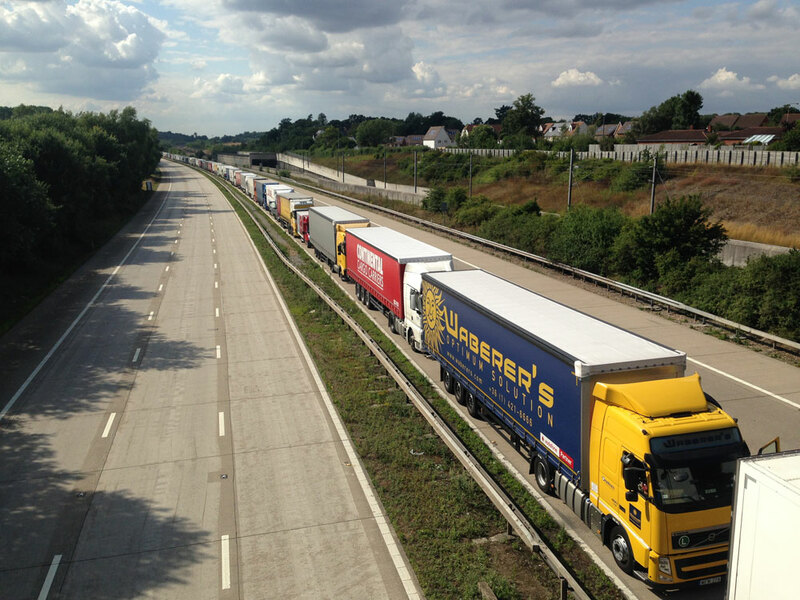 Operation Stack is controversial within Kent, principally because of the disruption that is caused by the closure of the M20 and the diversion of significant amounts of traffic onto what are normally local roads. In particular, Phase 4 is unusual in that it involves closing the M20 between junctions 9 and 10, the section forming the Ashford Bypass. Where all the other closures divert traffic off rural sections of the M20, leaving the motorway open past towns, Phase 4 causes all M20 traffic to pass through Ashford itself, causing chronic congestion across the whole of the town as motorists attempt to find clear routes from one side to the other. Where the closure involves closing the M20 in the coastbound direction only, the opposite carriageway remains open, meaning that traffic on the local road network may sometimes be badly congested in one direction but clear in the other. Since it was first implemented as an emergency measure in 1988, many alternatives have been proposed, but none have managed to replace it. 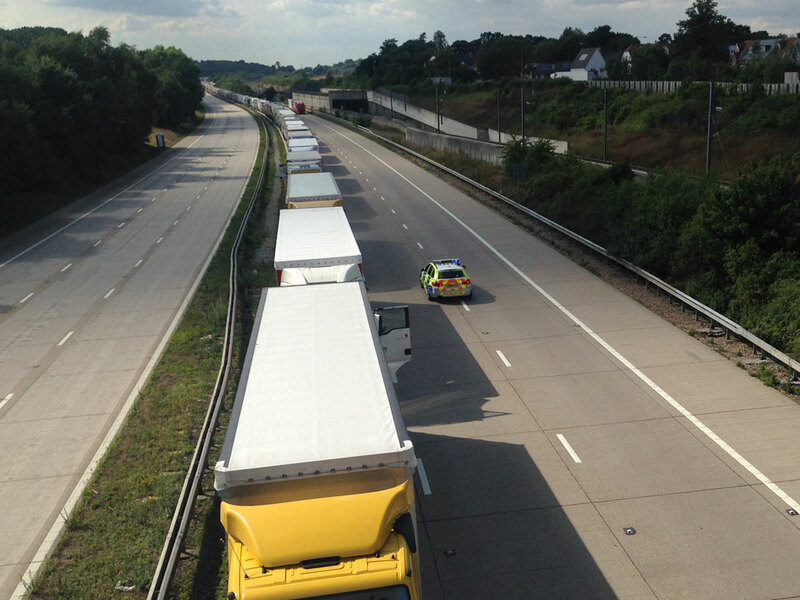 Operation Stack is now effectively business as usual for Kent Police in the event of any cross-Channel disruption. It's estimated to cost them hundreds of thousands of pounds in overtime payments each year. Most proposals involved creating dedicated HGV parking space somewhere in Kent to allow HGVs to be stacked off the motorway. Kent County Council once reached the point of negotiating for the purchase of land to provide for this, but a lack of agreement between the County Council and the various other local authorities in Kent over where parking facilities should be provided meant that this never happened. Highways England continue to favour the use of the Kent County Showground at Detling, adjacent to M20 junction 7, instead of Operation Stack, but there is significant opposition to this from locals who are concerned about the level of congestion this would create surrounding the showground. The most recent proposal, made following the unprecedented use of Operation Stack during July 2015, was for the Ministry of Defence to release land somewhere in Kent for use as a temporary lorry park. An agreement was then reached for the site of Manston Airport in North Kent, near Ramsgate, to be used experimentally as a lorry park. Manston Airport benefits from reasonably good links onward to Dover (though not to the Channel Tunnel) and being easy to reach from the M2. 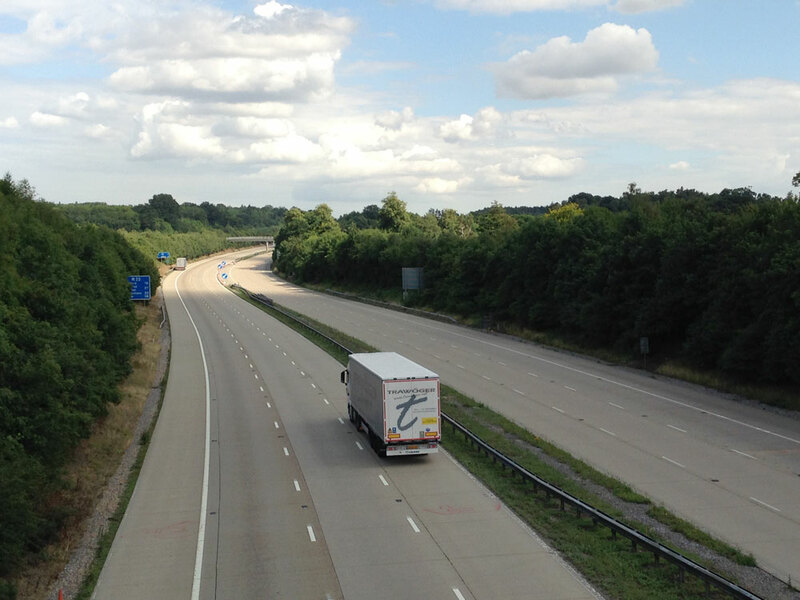 Not only are alternative sites difficult to find, but all these ideas suffer from the fact that the M20 itself is actually an extremely good lorry park, being easily reached from the rest of the UK and with direct connections to the Channel Tunnel and Dover. It's also close to the ports — which is why proposals to use sites further afield, including Manston Airport, are less suitable, because if a crossing suddenly becomes available then a block of trucks may need to get to the port very quickly to take advantage of it. That would be impossible if they were further away. Any real replacement would need to be just as close to the ports, just as well connected and just as big. That's a tall order. The only other idea that has been explored in any detail is to set up contraflow running on the Londonbound carriageway of the M20, so that traffic in both directions can continue to use the M20 while Operation Stack is running. This would allow the M20 to continue being used as a lorry park while greatly reducing the effect of the closure on the local road network. Unfortunately, when a contraflow was attempted, the length of motorway involved meant that it took two days to set out the temporary traffic management and a further two days to clear it away — not a quick enough response when Operation Stack is often brought into action with just a few hours' notice in the event of poor weather or wildcat strikes. Highways England are now investigating the possibility of using a moveable barrier to set up the contraflow more quickly, but just like all the other solutions, there would be a significant cost associated with this, and nobody is willing to spend the money to fix something that is only ever a temporary, emergency measure. In the meantime, and for as long as no realistic alternative exists, Operation Stack will continue to feature prominently in the news, making sure that everyone in Kent feels the inconvenience of disruption to the ferries or trains.